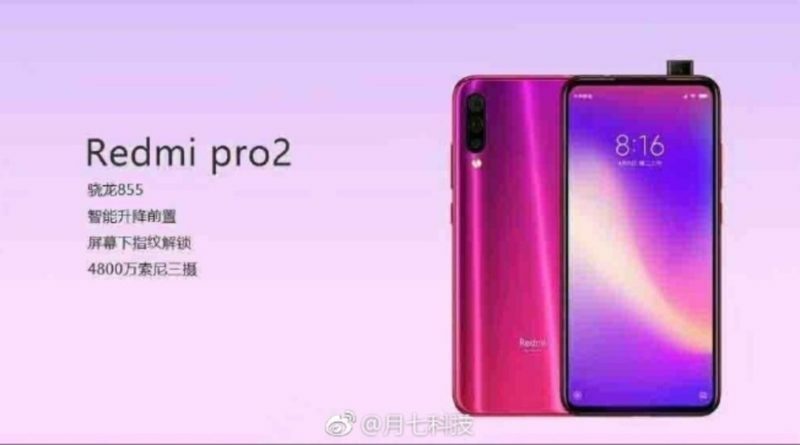 Redmi is all set to launch its new flagship smartphone Redmi Pro 2 : The company is now separated from its parent brand Xiaomi. The Brand Redmi is known for its Mid-range Smartphones and affordable pricing. The upcoming smartphone from the company has been spotted on Weibo. With Pop-up Selfie camera , Notch less display and Snapdragon 855 SoC. Company’s Executives has also confirmed the launch of smartphone to held very soon. It will be the first premium smartphone from Redmi after the separation from Xiaomi. This upcoming device has been in the leaks from past few days. According to leaks and reports the device will come triple rear camera setup with a 48MP Primary sensor from Sony. Lei Jun, Redmi CEO has also confirmed that the device feature notch less , hole-less Display. It is expected to come with FULL HD LCD Display with resolution 1920 x 1080 pixels. Moreover , the latest renders confirms that redmi pro 2 will also feature in-display fingerprint sensor. The main highlight of the smartphone will be 16MP pop-up selfie camera. It will be the first smartphone from Xiaomi or Redmi which will feature pop-up selfie camera. The mobile phone could be powered by a 4,050 mAh battery which will also support fast charging technology. It will come with a USB type-C charging port. Moreover It will run on run on Android 9.0 Pie out of the box with the company’s own MIUI on top. It will also get 3.5mm headphone jack as well which is not considered in new smartphones nowadays. Under the hood , it will be powered by Snapdragon 855 octa-core Processor. Further more , It is expected to launch in second half of 2019 , However there are very less chances of Redmi 2 pro device to launch in India. For more information regarding upcoming xiaomi mobiles follow us on Twitter , Instagram etc.